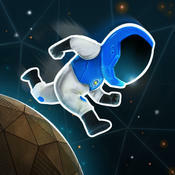 Asterings is a thrilling interstellar race. Challenge yourself and others, as you tap your way across the Multiverse! Fly your rings at insane speeds. Smash all the records. Dash across space and find your tempo through deadly obstacles. Collect as many gems as you can, then use them to unlock new worlds and mightier rings. PS. Exploding is a big part of the process. There is no shame in it. Let us know if you find any! Your comments are valued and appreciated!